Jesus freak Hideout (John DiBiase): Did you guys set out to make a relationships record with The Long Fall Back To Earth or did it come out pretty naturally? Matt Odmark: Yeah, a friend of ours is always advocating for this concept that ideas have legs. And what he means by that is: I think if you look at Good Monsters, it was really sort of an epiphany kind of record with some kind of big ideas behind it. But if you believe that ideas have legs, it's sort of like [wondering] whether or not an idea means anything or has any sort of substance and does it work on the ground level where life really happens. And I think Dan's instinct, as we started to write this record, was he wanted to sort of take the ideas from Good Monsters and play them out in relationships and see if they really work. I mean, this is where we're living. And inner personally, I think it mirrored where we're at. Good Monsters was a season of a lot of inner personal change for the four of us. For the most part, [it was] a spurt of real growth and what it meant to find community and to really have our feet hit the solid ground of that. But then, we've been living in the last four years in sort of hard work of what it means to try to be in friendships and in relationships and how the clarity that happens in that initial moment doesn't always sustain. Definitely, things get murky and complicated. And so I think before I knew that's where we were going, that was kind of Dan's initial instinct to write about that place. And I think as we began to do that, we began to see the connections between the two albums in between. Dan Haseltine: I tried to begin writing from the same place that Good Monsters was coming from. I mean, at first, I think we were worried about it, cuz we really did look at Good Monsters as this really amazing project -- just for us as songwriters, as communicators, as producers, we felt like we put something together that we were really proud of. And then to go back in, it was difficult because we felt like we were hearing a lot of people talk about social justice and write songs about it and, whatever place I was at, they weren't inspiring at that moment anymore. Although I certainly still connected with the fact that we need to engage and we need to be invested in those things, it wasn't what I was feeling like writing about. And every time I would try to approach that that way, it was too high. It was too still in that thirty thousand foot place of broad ideas and it just wasn't where I wanted to be. Charlie Lowell: It wasn't moving us. Dan: *Steve laughs* Well yeah, thanks! I didn't want to pretend to be someone else, y'know? I didn't want to be like, "Well this is how Derek Webb would write a song." or "This is how..." Y'know? I wanted it to still be us. Charlie: One of the challenges on songs more sort of world view focus, like "Headphones," there's a little social commentary in it, but then the challenge that Dan kept coming back to on that song was how do we still make this a personal song about connecting or not connecting. And bringing in Katie's voice on it and making it sort of this "missed conversation." It puts a point on the concept of the song in a way that ties in with the record where it could stand outside as this ethereal song about our headphones and disengaging, but instead, it gets real specific. Dan: And Steve really championed that. Because we had written the song from the perspective of one person -- just "this is my observation," and more of a narrative -- but then Steve kind of had the idea, actually a lot like "Mirrors & Smoke," where it really was kind of Steve to come in and go, "what might actually turn this song and make it a little bit more compelling is if it actually turns into a bit more of a dialog, a conversation." So he had done that with that ("Mirrors & Smoke") and brought in Leigh Nash and then this time, we brought in Katie Herzig. Steve: Yeah... and y'know, maybe after that... Feist on the next record. Steve: And you know, "Boys," getting obviously more inner personal with having children, there's many different contexts for the idea of relationships and how in each of those, we uniquely come to our own ends of what we think will work. I think, especially, in the conversation between the genders, it's really powerful to highlight the ways that we want to connect to -- whether it's a wife or girlfriend or just a friend -- we want to connect and yet we miss each other and to be articulate about that, which I think "Headphones" does and "Closer," it really does highlight the Ecclesiastical longing for what we want that's greater than what we feel like we are that kind of resides inside, and what it means in those moments when we do find each other and we experience that "hallelujah" and the "amen" of "We're here in this moment and we agree and it won't always be like this, but this is good." And we get to that in the record, too. It's not just longing and unfulfilled. Because we have those moments, too, that we celebrate. Charlie: Is it? [Still] after a few weeks? Cool. Steve: It makes me... y'know... I'm not going to be all sappy and silly, it's just that there a few songs... Like "Boys" - the first time we played "Boys," I was like *makes an emotional face* Nooo! I should have thought about this before we played it. Because they are very personal songs. Dan: Shut it off! Bury it deep down! *laughs* No, but just kind of, "How are we going to get through this?" because in a way it is a lot more emotional. It's a more emotional record. Charlie: It's just hard to be co-humans. JFH (John): Now did a specific event inspire "Safe To Land?" Matt: I'll speak, cuz yes and no... I came in that day just wrestling with some hard stuff. I was definitely feeling the emotion of that song in a specific way. And I kind of shared with the guys and I said, "Is there some place we can go with this?" So when we first started writing it, I think the lyric was like, "Is it safe to love?" or something like that and I think I misunderstood Dan, and I said, "Are you saying 'Safe to love' or 'Safe to land?'" And we were all like, "'Safe to land,' that's better, let's go with that." I remember kind of going, "Let's chase that for a little while." Dan: Didn't change Matt's percentage of the publishing. Steve: No it didn't, but it made the song better. Matt: It's interesting. There are certain songs when you know kind of at the moment of conception or the writing of the song that it's special. Then there are other ones where you write 'em and you sort of get the bits and pieces of the song, but you're not really sure -- you're still using your imagination, like "When the big drums come in here and the explosions happen over there, it'll be good." So "Safe To Land" was one of those ones I think, in its nucleus form, we knew it was a pretty special moment. Charlie: We were very pleased. Matt: *Points to Steve* You came in with the musical idea first, that's kind of where it started. The "Ooo" part. I remember you played that for us and we were like "Wow, that's really cool"
Matt: That's how that one kind of snowballed into being. Charlie: It's naming something very specific. For me, it makes me think - most obviously - every time we come home from the road, whether it's four days or two weeks. It's like, I keep telling myself, "You've been doing this for fifteen years, it's getting easier, you know what to do now." And it confounds me that each time I come home and there's like, "Whoa, but your world and my world have been so different! You have to kind of let down and I'm kinda coming down and we're missing each other." And it's like, man... you think you'd be good at it doing the same thing over and over. So that song sings that struggle so well, but I think in the struggle, the choice to pursue and to fight for what's good, to choose to love, that's sort of the exclamation point for me. Steve: It's really one of the most innocent beauties there is when people humble themselves and find each other again that way, because there's so much that pushes against that -- whether it's self-protection or fear about what that will look like. My friend David Dark says, "If it's good news, it's Gospel!" and I think that's Gospel when people find each other in a posture of humility that way, even in the midst of all the things that vie and push us away from community and being known where we're at. Matt: It's a powerful thing. I just read an Ian Forrester book this year, and all his writings are about that idea of what happens to us as humans when we connect, and not even when we connect one to each other, but when we connect the dots of our lives and our stories or when we fail to. If you look at the characters in his novels, he always mends to either their health or their demise - sort of figure out a way or don't figure out a way. All of the characters in his books, whether they're heros or anti-heros, it usually sort of comes down to the fact that - are they making the connections or are they not? It's kind of a simple concept, but painful and hard work. JFH (John): Do you guys have a favorite song on the record - at the moment at least? Steve: Y'know, one of the things that just occurred to us talking here in the last few hours is "Weapons," for me, is really really powerful. I'm reading David Dark, our buddy's book called "The Sacredness of Questioning Everything," which has been great, about this idea that I think is highlighted in "Weapons," when Dan kinda came with that idea. It was one of the last songs we wrote on the record. And it really puts a lamp, a huge spotlight on the ticker mentality of our conversations - and David's book speaks to this as well - the end goal isn't to prove myself right to you or to kind of hang on to bitterness as a some sort of blanket or resentment as some sort of comfort, but the victory, the end goal is actually the process of discussing, the actual conversations. The good news of the Gospel is that we can share together and I think so much of the news ticker, kind of fear-based mentality and one-liners, whether it's socially, politically, economically, is to manifest a position and something else to cling to rather than understanding what real faith of hope and trust in good news looks like, which is relinquishing all those things and abandoning ourselves to being known. And at the end of the day, [it's] having to say what it is I want from life, from relationships, from God. And it's easier to have a zinger one-liner *laughs* than it is to have to express those things, because those can only come from the heart. And "Weapons," I think, exposes how bitterness and especially hating things or being offended at things that God will hate will keep me on God's side and keep me from being vulnerable about my own weakness. Charlie: Yeah I totally agree. And this didn't occur to me when we sequenced the record I don't think, but looking back, I love how "Weapons" asks the listener to drop your guard and disarm. If you're gonna dig into these songs and get anything out of them, you have to sort of drop your defenses and your things that instead keep you comfortable and jump into it. Dan: It felt like this sort of idea that the endgame of bitterness is that it leaves you with no options but to be defensive. And if you're always defensive and you're never engaging, you're never able to be for something, and that means you're never even free yourself. And I think that's to be able to kind of strip away those things, lay down the reasons why you'd defend yourself even, and all of the tools we use to hide. I was really excited we were able to get that on the record! 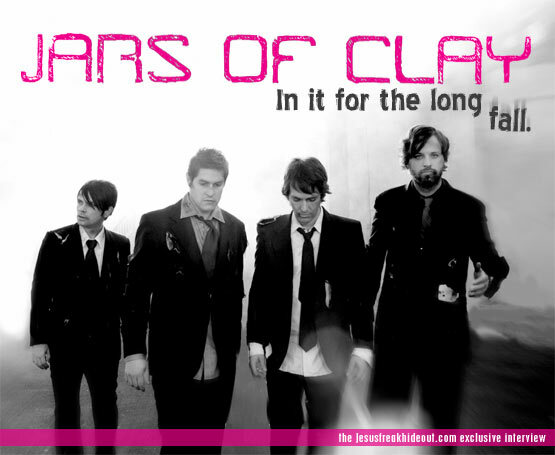 Jars Of Clay's latest album, The Long Fall Back To Earth, is available now.